In addition to globalization, a glowing report on Maoism and evidence of the promotion of Marxism can also be found in Crayola recommended curriculum resources. Shortly after posting an article recently on Crayola and Common Core’s promotion of globalization, the link to Crayola’s list of recommended resources disappeared. Fortunately, I saved a few screen shots and was able to use that information to locate it again. In looking again at these resources, I found a lot more that parents need to know, so please share. See some of Crayola’s recommended curriculum resources below along with a few notes. The original post, Crayola Common Core Lessons Promote Globalization and Interdependence, can be found below as well. The screen shot below shows several resources on ‘Collaboration’. These resources and others like them are used by progressive educators to promote collaboration over individualism — collaboration being a necessary step on the path to collectivism/Marxism. Crayola joins the list of big name education companies who have sold out our children and America to the United Nations’ global agenda. 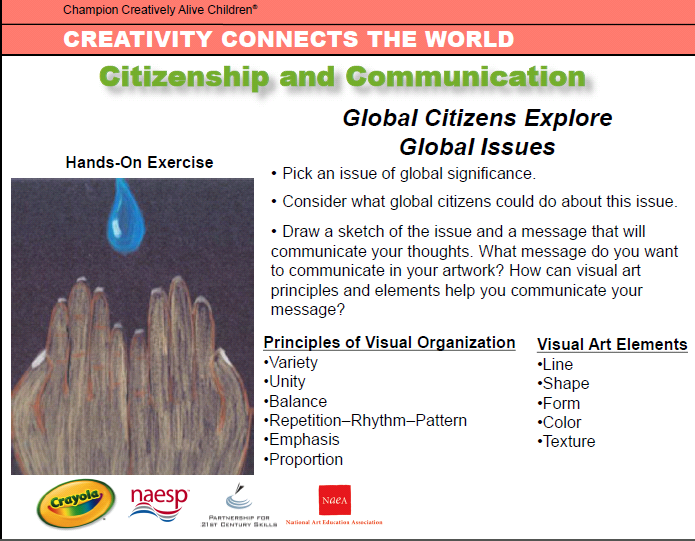 Teaching children ‘to take action as global citizens’ in an ‘interdependent world’ and to ‘think about the world more holistically’ are the focus of Crayola lessons provided in partnership with the Council of Chief State School Officers (CCSSO), one of the two main organizations responsible for the creation of the national Common Core State Standards. Crayola, Lego Education, Apple, and Disney (among others), as members of P21 — Partnership for 21st Century Skills, entered into a ‘strategic partnership‘ with the Council of Chief State School Officers in 2010. According to P21′s Executive Chair, Kathy Hurley, CCSSO and P21 work very closely on Common Core, as well as CSSO’s Next Generation Learner program, and the Elementary and Secondary Education Act re-authorization. Hurley is also Senior Vice President of Strategic Partnerships for Pearson Education. Pearson, in partnership with CCSSO, has been instrumental in implementing Common Core in many states by providing resources and employing progressive educators, like Coalition of Essential Schools disciple Grant Wiggins, to provide professional development training. The U.S. Department of Education hosted the launching of P21 and Crayola’s Champion Creatively Alive Children program in 2011. Crayola lessons, like other Common Core material, are designed to create, in children’s minds, a specific and biased perspective of the world — globalization over national sovereignty, interdependence over self-reliance, and social and economic equity governed by a few over social and economic freedom governed by self. 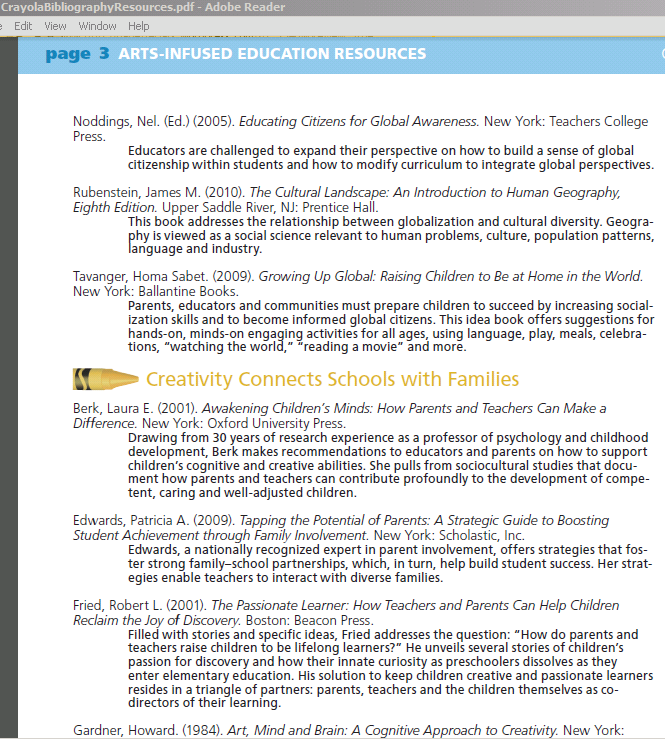 Crayola-recommended resources promoting social justice, globalization, and the theory of global warming, are listed here along with writings by humanist Linda Darling-Hammond, CSCOPE’s Robert Marzano, and progressive Howard Gardner, also CES disciples. Read more about CES (Coalition of Essential Schools) and Common Core at Unravelled! The 30 Year Agenda Behind Common Core and at the Common Core / CSCOPE / CES Connection page. James Rubenstein’s anti-semitic book, The Cultural Landscape, is also listed as a Crayola Arts-Infused Education Resource. Despite Arne Duncan’s denial that Common Core purposes a political agenda, the curriculum itself proves otherwise — that Common Core has everything to do with the political and global agenda of those who created it, and nothing to do with a sound education for the benefit of those being taught — our children. Go here for an important update to this post. According to P21’s Executive Chair, Kathy Hurley, CCSSO and P21 work very closely on Common Core, as well as CSSO’s Next Generation Learner program, and the Elementary and Secondary Education Act re-authorization. Posted in COMMON CORE/CSCOPE - GENERAL, COMMON CORE/CSCOPE/CES CONNECTION, WHAT ARE THEY LEARNING? The above quote comes from Obama’s March 18, 2008 speech on race, and it confirms that President Obama completely supports the reparation agenda. As I will explain below, in order for the reparations movement to succeed, there must be a perception among the majority that there are disparities that exist in the African-American community today that are a direct result of slavery. This is the crux of the reparations movement. This portion of The Reparation Agenda series shows the legal barriers faced by advocates and reveals how President Obama is walking in step with the appointees, friends and colleagues mentioned previously in this series to ensure that those barriers are removed. For example, the very language used by the president and so many others is crucial to shaping the movement’s claim to fit the rule of law and vice versa (gradually change the law for the benefit of the movement). In the most recent article in this series, The Reparation Agenda: Obama Friend Sponsored City Ordinance Used to Extort Millions from Corporations with ‘Ties to Slavery’, I mentioned that reparation activists have learned from past failures that courts require the naming of specific plaintiffs in a lawsuit, as opposed to demanding reparation for a broad unspecified group of people who may or may not be the descendants of slaves. There are other legal or procedural hurdles faced by reparation activists as well, including, ‘standing’, ‘statute of limitations’, and ‘sovereign immunity’. Adjoa Aiyetoro is co-chair of the Reparations Coordinating Committee, alongside Charles Ogletree, President Obama’s close friend, mentor and advisor to his 2008 presidential campaign. In a 2003 paper, Formulating Reparations Litigation Through the Eyes of the Movement, Aiyetoro addresses the ‘procedural hurdles’ faced by the reparations movement and the strategies being developed to overcome them. Standing means that a person seeking reparation must show that their legal rights have been violated and that the violation resulted in a concrete injury or “injury in fact”. Obviously, plaintiffs to reparation lawsuits today weren’t alive during the slave era so they seek reparation due to the enslavement of their ancestors. Now that several of President Obama’s appointees and friends have succeeded in obtaining the names of many slaves and their descendants, as explained here, they must show that the descendants themselves have suffered a concrete injury. Aiyetoro asks the question, “How can an individual be injured in the legal sense by institutions and practices abolished over a hundred years ago?” The answer, she writes, is that the 13th Amendment allows African descendants to seek reparation when the United States fails to eliminate the badges and incidents of slavery. In other words, America must be viewed as a racist, oppressive country that does not offer the same opportunities to African-Americans as it does to whites. If America is given credit for any of the great strides and efforts it has made in the last century to offer equity and opportunity to all people, then the reparations movement has no case because there is no continuing injury. Aiyetoro mentions disparities in prison sentencing as one badge of slavery, claiming that African-Americans still receive harsher punishment for crimes than their white counterparts. She refers to the Sentencing Project and the NAACP Legal Defense Fund as two of several organizations that support the view, and claim to have proof, that African-Americans are subjected to harsher prison sentences than whites. Other badges of slavery (continued injuries) alleged by reparation activists include disparities in income, education, housing, and health care. Refer back to President Obama’s quote at the head of this article –- that there are many disparities that exist in the African-American community today that can be directly traced to the inequalities passed on from slavery and the Jim Crow era. How many times have we heard the president mention inequalities in education, housing, and health care? Why does he, his administration, and the media that resides in his back pocket, constantly cry ‘racism’, even where there is none? Because there has to be a perception that the rights of African-Americans are still being violated today: standing. Aiyetoro addresses the statute of limitations as another hurdle for reparation claims. Statute of limitations is a time limit. Under federal law, depending on the type of crime or injury sustained, a lawsuit must be filed within one to six years after the injury occurred. Aiyetoro offers another possibility around this hurdle suggesting that the United States should establish that the Trans Atlantic Slave Trade and chattel slavery were crimes against humanity and there are continuing injuries from these crimes. This is key because there is no statute of limitations (time limit) for crimes against humanity under international law. As of the date of her writing on these legal hurdles, the United States had not yet admitted that slavery was a crime against humanity. However, our government has done so since. In 2008, USA Today reported that then Senator Barack Obama and thirteen other senators were backing a proposal that called for Congress to apologize for slavery and subsequent Jim Crow laws. As I discussed in previous articles in this series, several people surrounding Obama have succeeded in pulling public apologies out of corporations and universities. Several states and the house of representatives have issued formal apologies for slavery as well. The congressional apology that was originally backed by Obama came on June 18, 2009, shortly after he took office as president. The third hurdle Aiyetoro discusses is sovereign immunity. Many reparation activists, including Aiyetoro and Ogletree, have said they intend to pursue claims against the federal government, in addition to corporations, universities, and state governments. However, the United States government currently has sovereign immunity from lawsuits seeking monetary damages. This was a tough one in 2003 when Aiyetoro wrote about the problem of sovereign immunity. In fact, she offered no possible solution other than to locate a specific waiver that could be used to have the government waive its immunity. No president in the history of our nation has ever waived our sovereign immunity for claims like these. So why would Aiyetoro, or anyone else for that matter, think that a waiver would be of any use? Perhaps she knew Barack Obama might one day be in the White House. A waiver with regard to reparation claims would open the door for millions of African-American citizens to sue the government for slavery. But it appears President Obama is willing to go even further by completely relinquishing our national sovereignty. Today, the Obama administration is dangerously close to ratifying the Rome Statute of the International Criminal Court (ICC). Ratification would make the U.S. a member to the ICC, thereby relinquishing our sovereignty to the United Nations. Under international law, members of our government and military could be prosecuted for going to war without U.N. approval and for actions during wartime, including alleged ‘torture’ crimes like waterboarding. United States government agencies, corporations, and citizens could be tried for crimes against humanity and made to pay reparation to African slave descendants both here and around the world. The Rome Statute of the International Criminal Court was established to investigate and prosecute international crimes of genocide, aggression, war crimes, and crimes against humanity. Shortly after its creation, the Clinton administration signed the statute but stopped short at calling on Congress to ratify it. Recognizing the inherent dangers, former President George W. Bush unsigned the Rome Statute during his term only to have President Obama sign it again in 2010 on behalf of the U.S. Although the ICC is limited to only prosecuting crimes that occurred after the court was established in 2002, many reparation activists are looking to the ICC because it does have the ability to prosecute crimes committed before it was established if the crime or injury continues today. The same year the United Nations established the ICC to rule on crimes against humanity, it also adopted a declaration submitted at the World Conference Against Racism that very specifically identifies the trans-atlantic slave trade as a crime against humanity and the cause of the continued suffering of African-Americans. This is the fifth article in this series and so far it has shown a great deal of effort on the part of many within the government, churches, schools, and the media. In fact, there is a literal re-shaping of society taking place that just so happens to fit perfectly into the framework of what the reparations movement needs it to be. It’s unclear whether the end game would be checks drafted to the descendants of slaves, land rights, the redistribution of wealth, or the complete destruction of capitalism for the sake of globalization. Many reparation activists express completely different goals from others within the movement. So why are they working together? In the next and final article in this series, I will explain one reason for the joining of forces, and also talk about ‘unjust enrichment’ — another claim being made in reparation suits. I will also explain the reason, I believe, Charles Ogletree tried to hide Obama’s relationship with Derrick Bell.